12% like the ability to call or talk with others at any time (this includes phrases such as “making phone calls,” “talking with other people,” or “calling whenever”). 11% like that their cell phone can help them get assistance in an emergency (this includes phrases such as “emergencies,” “safety,” or “security”). 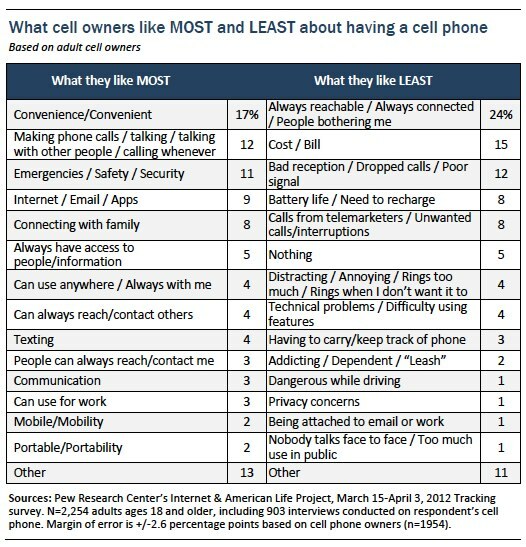 Using the internet, email, or apps (9% of cell owners say that this is the thing they like most about their phone) and connecting with family (8%) also place relatively high up on the list of things people like most about cell ownership. Despite the pronounced differences between smartphones and other cell phones when it comes to the capabilities of these devices, there are only modest differences between smartphone and non-smartphone owners in terms of what they like most and least about cell phone ownership. These relate primarily to internet/email/apps use, and the availability of cell phones in case of an emergency. Some 16% of smartphone owners say the ability to use the internet, email or other apps is the best thing about having a cell phone (compared with just 2% of more basic phone owners), while non-smartphone owners are much more likely to say that the best thing about their phone is the ability to get help in the event of an emergency (20% of basic phone owners say this, compared with 4% of smartphone owners). These differences between smartphone and non-smartphone owners are intertwined with the age profile of those who use each type of phone. 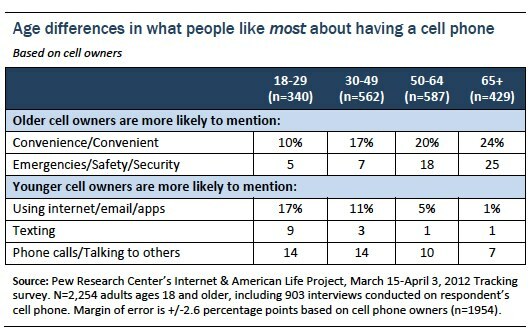 Older cell owners (who tend to have more basic devices) are especially likely to say that they appreciate the convenience of their cell phone and its utility in the event of an emergency: one-quarter of cell owners ages 65 or older cite each of these factors as the thing they like most about their cell phone. Younger cell owners, on the other hand, are more likely to say that the best thing about owning a cell phone is the ability to use the internet, email, or apps, or to use text messaging. African American cell owners are more likely than whites (by a 15% to 8% margin) to say that using the internet, email, or apps is the thing they like most about their cell phone, as well as to say (by a 21% to 14% margin) that the cost of cell ownership is the thing they like least. Women are more likely than men to say that getting help in an emergency situation is the thing they like most about having a cell phone (15% vs. 8%).